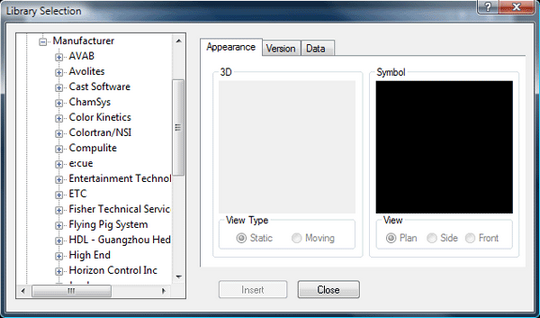 WYSIWYG is a 3rd-party visualizer software by CAST Software. MADRIX has been officially implemented into WYSIWYG since WYSIWYG R23. A maximum of 64 DMX universes can be sent to WYSIWYG in this way. 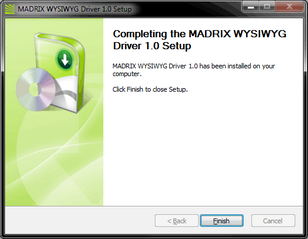 1] Install the WYSIWYG driver for MADRIX. 2] Activate WYSIWYG in MADRIX. 3] Connect MADRIX with WYSIWYG. 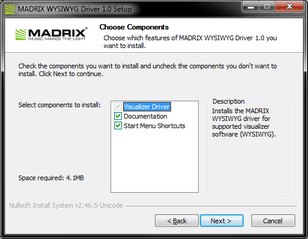 ▪ To use WYSIWYG with MADRIX, you have to install the MADRIX WYSIWYG driver first. 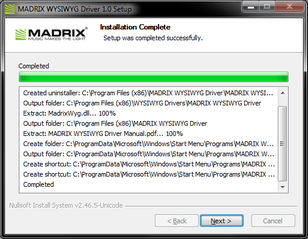 ▪ If you have already installed MADRIX without this component, re-install MADRIX. 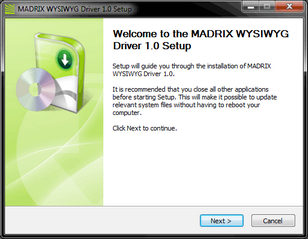 ▪ During the MADRIX installation process, a second setup wizard will be launched for the MADRIX WYSIWYG driver. ▪ Click Back in order to return to a previous step during the setup process. ▪ Click Next to start the installation. ▪ The License Agreement will appear. 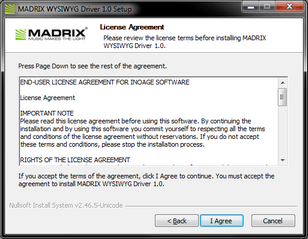 It outlines the terms you are agreeing to by installing the software. You must accept these terms in order to continue. 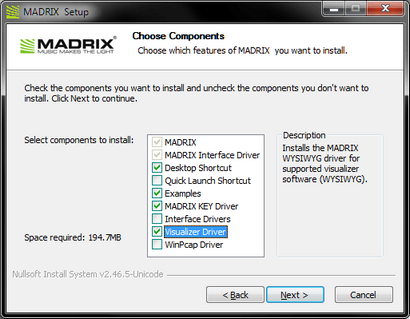 ▪ This window allows you to select which components and which drivers you want to install. A description is given for each item. ▪ Visualizer Driver - It is always required to install this component. ▪ Documentation - Select if you wish to install this user guide as a separate document. ▪ Start Menu Shortcuts - Select if you wish to install short cuts in the Windows Start menu. ▪ Next - Click Next after choosing the components in order to continue. ▪ Choose an installation directory [Install Location] on your harddisk where the driver will be installed. A default Destination Folder will automatically be provided by the setup. ▪ Browse - Click to change the folder. ▪ Next - Click to start the installation process. ▪ Choose an installation directory [Install Location] on your harddisk where the documentation will be installed. 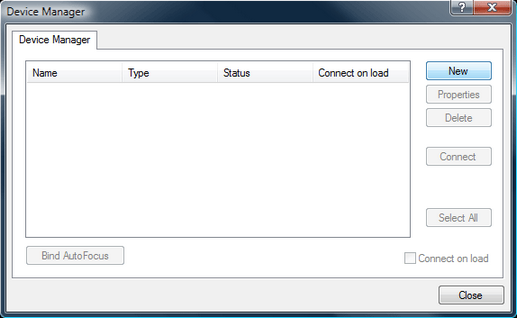 A default Destination Folder will automatically be provided by the setup. ▪ Installation Complete - Click Next when this message shown. ▪ Finish - Click to quit the setup. 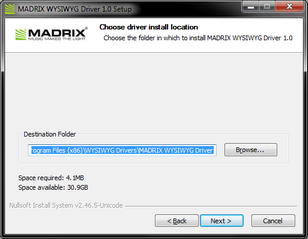 ▪ Port - Make sure that the port number matches the port number in MADRIX WYSIWYG Driver Configuration window. The default Port is 3454. [MADRIX will automatically search for running WYSIWYG devices on your local computer or in the network. 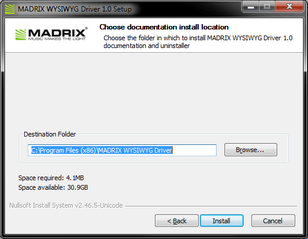 Make sure that the port number matches the port number in the MADRIX WYSIWYG Driver Configuration window. ▪ Your WYSIWYG device should appear in the list [displaying State Online]. B] New - Allows you to manually add a WYSIWYG device. ▪ Configure your manually added devices as described next. ▪ Select your device in the list and click in order to configure your device. ▪ A new window will open [WYSIWYG Device Configuration]. 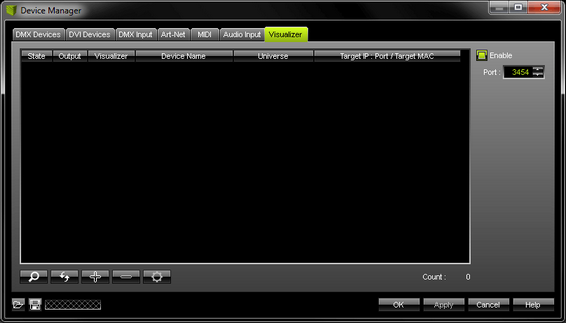 - Enable - Activates or deactivates DMX output to the WYSIWYG device. - Device Name - Allows you to change the label of the device in MADRIX. 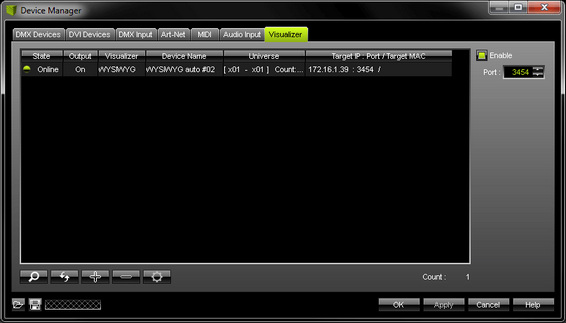 - Start Universe - Defines which data is sent to the WYSIWYG device starting with this DMX universe. Please set up this setting! - End Universe - Defines which data is sent to the WYSIWYG device ending with this DMX universe.Please set up this setting! - Pay special attention to the End Universe. Make sure to set it up correctly and corresponding to WYSIWYG! - IP Address - Enter the correct IP address of the WYSIWYG device. If the device was detected automatically, you do not need to change it. - Network Port - Enter the correct network port of the target computer, on which WYSIWYG is running. If the device was detected automatically, you do not need to change it. You can only enable DMX Output if the State of WYSIWYG Device is Online. In other words, the WYSIWYG driver must be up and running on the same computer or in the network. ▪ If the connection is established, a message will be display that reads X MADRIX device(s) connected in the WYSIWYG Driver Configuration. WYSIWYG can connect up to 20 computers running MADRIX and vice versa. ▪ Switch to LIVE mode. ▪ Open the LIVE menu. ▪ A new window box will be displayed. ▪ Address - In the Property window box fill in the IP address of the computer that runs MADRIX [e.g., 192.168.2.33]. ▪ Click Connect in the Device Manager window box. For more information on how to create and edit patches, please refer to the WYSIWYG documentation.